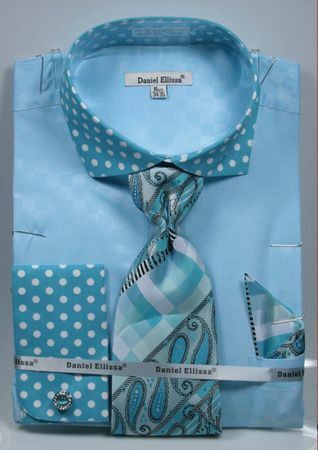 Make an impression stick like glue by wearing mens french cuff dress shirts by Daniel Ellissa. Daniel Ellissa is a leader in designing mens french cuff dress shirts for the man who likes wearing bold style dress shirts. This turquoise color french cuff dress shirt features a spread collar and cuffs with polka dot fabric offset by a shadow pattern fabric body that will look stunning with a beige color suit or even a black suit for show stopping look.